In amyotrophic lateral sclerosis (ALS), hand muscle wasting preferentially affects the ‘thenar (lateral) hand’, including the abductor pollicis brevis (APB) and first dorsal interosseous (FDI) muscles, with relative sparing of the hypothenar muscles (the abductor digiti minimi (ADM)). This peculiar pattern of dissociated atrophy of the intrinsic hand muscles is termed the ‘split hand’ and is rarely seen in diseases other than ALS. The muscles involved in the split hand are innervated through the same spinal segments (C8 and T1), and FDI and ADM, which are differentially affected, are both ulnar nerve innervated. The physiological mechanisms underlying the split hand in ALS are incompletely understood but both cortical and spinal/peripheral mechanisms are probably involved. Motor potentials evoked by magnetic stimulation are significantly smaller when recorded from the thenar complex, compared with the hypothenar muscles, supporting a cortical mechanism. But peripheral axonal excitability studies have suggested that APB/FDI motor axons have more prominent persistent sodium currents than ADM axons, leading to higher axonal excitability and thereby more ready degeneration. Pincer or precision grip is vital to human hand function, and frequent use of thenar complex muscles may lead to greater oxidative stress and metabolic demands at both upper and lower motoneurons innervating the APB and FDI. The split hand is a useful diagnostic sign in early ALS, and recent objective studies indicate that the sign has a high degree of specificity. (A) The ‘split hand’ syndrome of amyotrophic lateral sclerosis. There is clear wasting of the first dorsal interosseous (FDI) and thenar complex but sparing of the hypothenar muscle (black arrows). FDI, thenar and hypothenar muscles are innervated by C8–T1, and FDI and hypothenar muscles by the ulnar nerve. The dissociated hand muscle involvement cannot be anatomically explained. (B) Hand muscle atrophy in C8 radiculopathy. Note the marked atrophy of the FDI as well as the hypothenar muscle (white arrows). The split hand has been rarely reported in patients with non-ALS related ‘pure lower motor neuron disease’—namely, autosomal dominant distal spinal muscular atrophy, spinocerebellar ataxia type 3 (Machado–Joseph disease) and juvenile muscular atrophy,14 as well as spinal and bulbar muscular atrophy (SBMA).9 There are only a few causes of painless hand wasting in the absence of sensory deficit, as is typical of ALS. These include thenar wasting from a cervical rib and band,15 spondylotic cord compression,15–18 compression of the deep motor branch of the ulnar nerve19 20 and carpal tunnel syndrome in the elderly, in whom there may be moderate or marked thenar wasting with little if any sensory deficit,21 and a C8 root lesion. All of these conditions have characteristic clinical and electrophysiological features, and the split hand phenomenon has not been reported in any of these conditions (see figure 1). A multicentre Japanese study systematically examined the sensitivity and specificity of the split hand in ALS (The Tokyo Metropolitan Neuromuscular Electrodiagnosis Study group).9 There were 77 patients with ALS, 171 normal subjects and 199 patients with other disorders affecting lower motor neurons/axons, such as spinal muscular atrophy, SBMA and axonal polyneuropathies. The split hand was strictly defined as APB/ADM CMAP amplitude ratio <0.6 or FDI/ADM ratio <0.9 (mean−3SD of the normal control data). Based on the electrophysiological criteria, split hand was found in 52% of ALS patients, in 5% of normal subjects and in 13% of disease controls. Among the disease controls, two patients with SBMA showed split hand; in ALS patients, the split is found with moderate sensitivity (52%) and high specificity (95% vs normal controls and 87% vs disease controls). A recent study has described the use of a novel neurophysiological measure of the split hand, ‘the split hand index’.22 This is the ratio of the CMAP amplitude of the APB times the CMAP amplitude of the FDI divided by the CMAP amplitude of the ADM. This study needs confirmation but appears to be a robust measure of split hand in ALS. Wilbourn thought that the lesion responsible for the ALS split hand was at the level of the cervical anterior horn cell, a view shared by others.4 9 14 In ALS, there is a greater reduction of the estimated number of motor units in the APB compared with the ADM.8 Also, the CMAP ratio of the APB/ADM is reversed in ALS—that is, <1 instead of >1, as is normal.8 Both of these observations indicate preferential involvement of the APB (lateral hand) compared with the ADM (medial hand), typical of split hand. Several nerve excitability studies in ALS have shown two types of abnormal peripheral motor axonal ionic conductances: increased persistent sodium currents and reduced potassium currents, both of which increase axonal excitability, presumably leading to generation of fasciculations of peripheral origin.11 12 Nodal persistent sodium currents are major determinants of axonal excitability. It has been suggested that the split hand may be explained by differences in membrane properties among motor axons innervating the APB, FDI and ADM. A recent study has investigated differences in axonal excitability indices in normal subjects.13 Nodal persistent sodium currents estimated by strength–duration time constant and latent addition were prominently greater for APB and FDI motor axons compared with ADM axons (figure 2). These findings suggest that motor axons with physiologically greater persistent sodium currents—namely ALS-like—may be more vulnerable and more readily die in ALS, and this may contribute to the development of split hand. Peripheral aspects of the split hand syndrome. Nodal persistent sodium currents estimated by the strength–duration time constant (SDTC). (A) Abductor pollicis brevis (APB), first dorsal interosseous (FDI) and abductor digiti minimi (ADM) motor axons of normal subjects. APB/FDI axons have a longer SDTC than ADM axons, suggesting more prominent persistent sodium currents (modified from Bae and colleagues).13 (B) APB motor axons of amyotrophic lateral sclerosis patients and normal controls. Amyotrophic lateral sclerosis axons have a longer SDTC than normal axons, suggesting more prominent persistent sodium currents (modified from Kanai and colleagues).11 CMAP, compound muscle action potential. When analysing the physiological basis of the split hand syndrome, simple comparison of the APB with the ADM CMAPs have major limitations as it is the thenar complex (both the median and ulnar innervated muscles) that are preferentially involved, not just the APB. 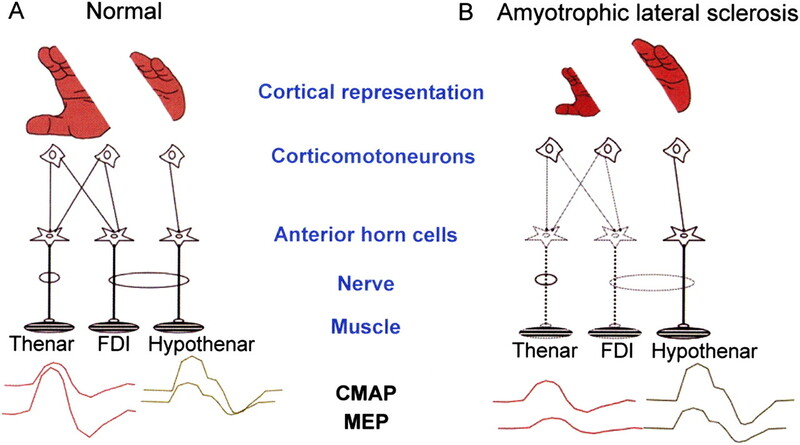 The ratio of the amplitude to the motor evoked potential (MEP) evoked by transcranial magnetic stimulation to the CMAP evoked by peripheral nerve stimulation is a measure of the motor cortical versus the spinal motor neuron pool input to a muscle. Because the MEP/CMAP ratio takes account of the lower motor neuron contribution, or disease, it is a useful indicator of abnormality originating in the motor cortex. In normal subjects, when TMS stimulation is maximal, the cortical/peripheral (MEP/CMAP) ratio is significantly larger for the thenar complex but not for the hypothenar complex.37–39 This is because the thenar complex is composed of both median nerve and ulnar nerve components. Median nerve peripheral stimulation at the wrist only activates the ‘median’ thenar complex but cortical stimulation activates both the ‘median and ulnar’ thenar complex. Cortical aspects of the split hand syndrome. (A) Cortical representation of the thenar hand (abductor pollicis brevis and first dorsal interosseous) used in precision grip is large compared with the hypothenar complex, and has a larger corticomotneuronal input. The motor evoked potential (MEP) is larger than the compound muscle action potential (CMAP) because both median and ulnar components are activated by transcranial magnetic stimulation. The hypothenar MEP is often smaller than the CMAP. (B) There is reversal of the normal situation. Cortical representation ‘shrinks’ and the thenar MEP is smaller than the thenar CMAP. The MEP/CMAP ratio of the hypothenar remains normal until more advanced disease. FDI, first dorsal interosseous. Although not completely specific to ALS, the fully developed lateral hand muscle weakness/wasting with relative or complete sparing of the medial hand muscles is a curiosity in conditions other than ALS. As such the split hand is a useful clinical clue to the early diagnosis of ALS. The functional deficit caused by the split hand is impaired precision (pincer) grip, and this pattern of muscle wasting is virtually unique to ALS. This complex motor movement is dependent on upper motor neuron integrity. This suggests that the split hand of ALS is predominantly due to a corticomotneuronal lesion. Nevertheless, lower motor neuronal (anterior horn cell) and motor axonal components are likely to also contribute to the development of the split hand. The combination of upper and lower motor neuron disease in ALS, and variation of disease progression and duration, will result in variability in the ‘completeness’ of the split hand manifestation. This results in lack of recognition and it is likely that split hand syndrome in ALS is to some extent fairly common. Comparison of the APB, FDI and ADM CMAP amplitude ratio is a helpful rapid screen for split hand but optimal analysis requires combined upper and lower motor neuron studies using MEP/CMAP ratio. Measures of pincer grip integrity, yet to be developed for ALS, may prove to be the earliest and most robust documentation of the deficit.
. Amyotrophic lateral sclerosis. Lancet 2011;377:942–55.
. ALS motor phenotype heterogeneity, focality, and spread: deconstructing motor neuron degeneration. Neurology 2009;73:805–11.
. Electrodiagnostic evaluation of the patient with possible ALS. In: Belsh JM, Schiffman PL, eds. Amyotrophic lateral sclerosis. Armonk, NY: Futura Books, 1996:183.
. The “split hand syndrome”. Muscle Nerve 2000;23:138.
. Dissociated wasting of medial and lateral hand muscles with motor neuron disease. Can J Neurol Sci 1994;21(Suppl 2):S9.
. Dissociation of muscle wasting of ulnar innervated and muscles with motor neuron disease. Third International Symposium on ALS/MND, November 1992, Solihull, UK.
. Comment on the lower motor neuron hypothesis. Muscle Nerve 1993;16:870–2.
. Dissociated small hand muscle involvement in amyotrophic lateral sclerosis detected by motor unit number estimates. Muscle Nerve 1999;22:870–3. ; Tokyo Metropolitan Neuromuscular Electrodiagnosis Study Group. Dissociated small hand muscle atrophy in amyotrophic lateral sclerosis: frequency, extent, and specificity. Muscle Nerve 2008;37:426–30.
. The split hand in ALS has a cortical basis. J Neurol Sci 2000;180:66–70.
. Altered axonal excitability properties in amyotrophic lateral sclerosis: impaired potassium channel function related to disease stage. Brain 2006;129:953–62.
. Axonal excitability properties in amyotrophic lateral sclerosis. Clin Neurophysiol 2006;117:1458–66.
. Differences in excitability properties of FDI and ADM motor axons. Muscle Nerve 2009;39:350–4.
. The “split hand” phenomenon: evidence of a spinal origin. Neurology 2003;61:1619–20.
. Wasting of the hand associated with a cervical rib or band. J Neurol Neurosurg Psychiatry 1970;33:615–24.
. Hand wasting in spondylotic high cord compression: an electromyographic study. Ann Neurol 1981;9:58–62.
. Hand wasting due to mid-cervical spinal cord compression. Can J Neurol Sci 1987;14:309–11.
. Myelopathy hand characterized by muscle wasting. A different type of myelopathy hand in patients with cervical spondylosis. Spine (Phila Pa 1976) 1988;13:785–91.
. Compression of the deep motor branch of the ulnar nerve: an unusual cause of pure motor neuropathy and hand wasting. Arch Neurol 2005;62:826–7.
. Pitfalls in the diagnosis of ulnar neuropathy: remember the deep palmar branch. Br J Hosp Med (Lond) 2010;71:654–5.
. Amyotrophic lateral sclerosis: a 40-year personal perspective. J Clin Neurosci 2009;16:505–12.
. Appearance, phenomenology and diagnostic utility of the split hand in ALS. Neurodegener Dis Manag (in press).
. Dissociated small hand muscle atrophy in aging: the 'senile hand' is a split hand. Eur J Neurol 2006;13:1381–4.
. Hand function: peripheral and central constraints on performance. J Appl Physiol 2004;96:2293–300.
. Amyotrophic lateral sclerosis (ALS): a phylogenetic disease of the corticomotoneuron? Muscle Nerve 1992;15:219–24.
. Novel threshold tracking techniques suggest that cortical hyperexcitability is an early feature of motor neuron disease. Brain 2006;129:2436–46.
. Evolution of the human hand: the role of throwing and clubbing. J Anat 2003;202:165–74.
. Evolution of grasping among anthropoids. J Evol Biol 2008;21:1732–43.
. A clarification of Pouydebat, et al. 2008, evolution of grasping among anthropoids. J Evol Biol 2009;22:2554–7.
. Early origin for human-like precision grasping: a comparative study of pollical distal phalanges in fossil hominins. PLoS One 2010;5:e11727.
. Precision grasps of children and young and old adults: individual differences in digit contact strategy, purchase pattern, and digit posture. Behav Brain Res 2004;154:113–23.
. Neuronal mechanism of functional recovery of dexterous finger movements after lesion of the corticospinal tract-studies in a non-human primate model (in Japanese). Brain Nerve 2007;59:511–20.
. Independent digit movements and precision grip patterns in 1–5-month-old human infants: hand-babbling, including vacuous then self-directed hand and digit movements, precedes targeted reaching. Neuropsychologia 2003;41:1912–18.
. Development of human precision grip. IV. Tactile adaptation of isometric finger forces to the frictional condition. Exp Brain Res 1995;104:323–30.
. The reliance on visual feedback control by older adults is highlighted in tasks requiring precise endpoint placement and precision grip. Exp Brain Res 2011;214:139–50.
. Stimulation of the cerebral cortex in the intact human subject. Nature 1980;285:227.
. Age-dependent decline in motor evoked potential (MEP) amplitude: with a comment on changes in Parkinson's disease. Electroencephalogr Clin Neurophysiol 1991;81:209–15.
. The clinical diagnostic utility of transcranial magnetic stimulation: report of an IFCN committee. Clin Neurophysiol 2008;119:504–32.
. Task dependence of esponses in first dorsal interosseous muscle to magnetic brain stimulation in man. J Physiol 1993;464:361–78.
. Concordance between site of onset and limb dominance in amyotrophic lateral sclerosis. J Neurol Neurosurg Psychiatry 2011;82:853–4.
. Sensory–motor coordination during grasping and manipulative actions. Curr Opin Neurobiol 1992;2:815–23.
. Hand coordination following capsular stroke. Brain 2005;128:64–74.
. Task-specific impairment of motor cortical excitation and inhibition in patients with writer's cramp. Neurosci Lett 2005;378:55–8.
. Disturbances of precision grip in Huntington's disease. Neurosci Lett 1997;226:103–6.
. Coordination of fingertip forces during precision grip in premanifest Huntington's disease. Mov Disord 2011;26:862–9. Funding This work was supported in part by Grants-in-Aid from the Research Committee of CNS Degenerative Diseases, the Ministry of Health, Labour and Welfare of Japan (SK).